Find all the posts about the things to do on Mauritius: outdoor activities, things to do with your children, a museum day or a trip to the market! I give you honest reviews of places we have been – you have it all here. 12 March is Independence Day in Mauritius! This year, 2018, the Island celebrated its 50th anniversary as well as it’s 26th year of being a Republic. Read all about our beautiful island! The National Airline for Mauritius, is Air Mauritius (fancy!) – here is all you need to know about their Business Class Lounge in Plaisance (aka Sir Seewoosagur Ramgoolam International Airport). All informations about Cyclones in Mauritius: whether you are looking for information on the warning system or where to find the most accurate and latest updates, this post is what you need! Do you need information about getting around in Mauritius: Should you want to take the bus or wondering how taxis work on the island you have it all here. A review of the Mauritius Aquarium. If you plan going, have a read – just so you know what to expect at this little attraction in Pointe aux Piments. Discover La Vanille Nature Park, or Crocodile park – we spend half a day here and the kiddos had so much fun. A must do with children when you visit Mauritius! Learn all about the activities and how to plan your day. Domaine de l’Etoile – a private estate open for discoveries and fun! Located on the eastern coast of the island, this nature reserve is full of activities for small children and big ones as well! Quad and buggies, trails, pony rides and zip-lines. A great place for the whole family or just for adults. One of the best family hikes of the island. Discover amazing views of the island at the top of Le Pouce mountain, called so because it’s cute thumb like shape. An interesting and diverse hike, fit for all. Ferney Trail – Mauritius has lots of trails organised during the year. Read this post to check how they are organised and what a fun day out it is! The kids did the 4km fun race and had such an awesome time. Visit, tasting and lunch at the Bois Cheri tea plantation. The plantations are the second stop on the tea route in Mauritius and well worth a stop if you are discovering the southern part of the island. Ganga Talao – The largest Hindu Pilgrimage site in Mauritius. History, religion and culture all in one place. 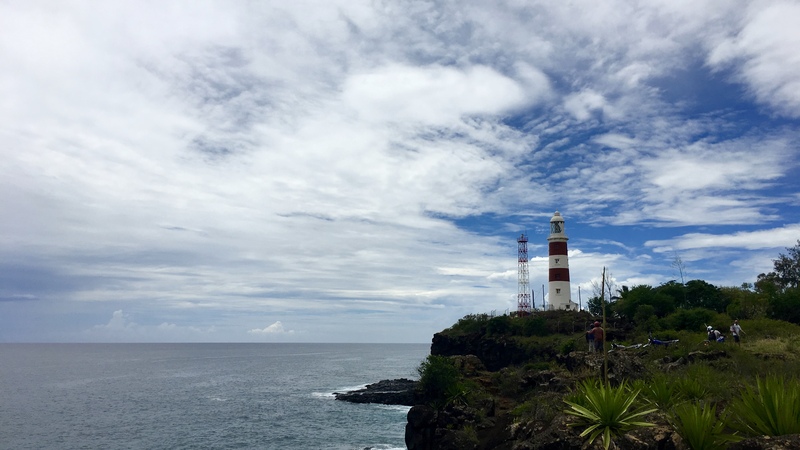 Grand Bassin is located in the southern part of Mauritius and one of these stops you have to make! The Château de Labourdonnais is a beautiful estate located in the North of the Island and the visit is well worth it to discover the colonial past of Mauritius, beautiful gardens and tasty rum. The Rhumerie de Chamarel is a beautiful place to discover the way agricultural rum is made in Mauritius. Read more about the tour, the tasting and also their restaurant. Visit The Blue Penny Museum in Port Louis! Learn all about our famous stamp, Paul et Viriginie and discover a great exposition about maps. They also do temporary expositions. Located in Le Caudan Waterfront. Discover the beautiful red roofed church, Notre Dame l’Auxiliatrice. Located in the small fishermen village Cap Malheureux – you will see the most enchanting chapel and some of the best views from the North of the island. Visit a Hindu temple! Sagar Shiv Mandir in Poste de Flacq, for example. A very special place, this temple located ‘in the water’. A small but lovely stop to see something else in Mauritius. The Story of Paul et Virginie, the two young Mauritian lovers, is worldwide known. It is a beautiful story and here I take you back in time. You get Mauritian history through a romance: you will learn all about the fate of the St Géran and the 2 lovers. The Gardens of the State House of Mauritius are open rarely to visitors, but it is such a lovely place. Clean and well maintained gardens, you even get a peak in the actual house of the President of Republic of Mauritius. 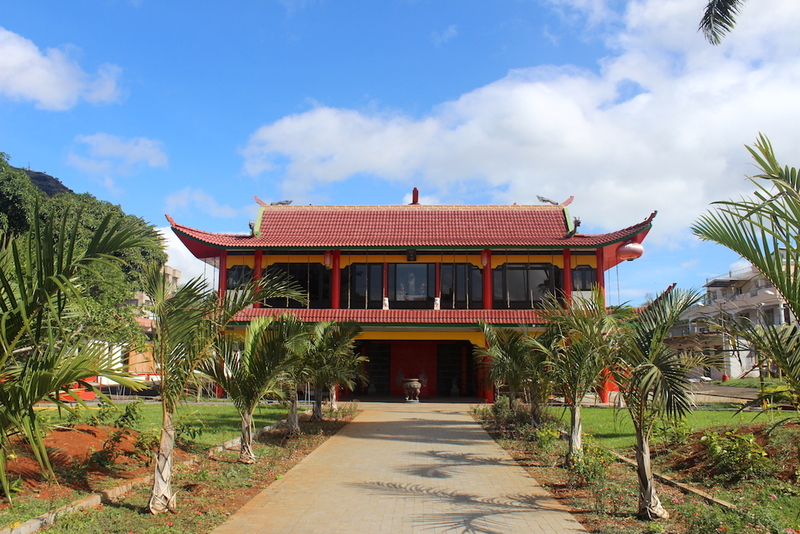 Visit the Chinese pagodas and learn about the Chinese Heritage in Port Louis. Something a bit different and that you might not expect to see in Mauritius. An intriguing story about The Slave Door – it will take you back to times when slavery was abolished in Mauritius, but you’ll notice that not everything changed overnight. A lovely little stop on the way up or down the west coast. A visit to the Lighthouse in Albion. Walks and beautiful views of the ocean. There are many walks to be done here and there in Mauritius. This time I take you through my old neighbourhood in Grand Baie. Check out the beach, a small temple and get a sense of what Mauritius really looks like! No filters needed. The small fish market in Grand Baie is worth a stop if just for the atmosphere. Located on the beach, you see the fishermen come in. A very ‘local’ experience – boats usually come in a little after 3pm. The oldest market on the island: take to Port Louis and discover Mauritius daily life at the central market! All your sense will be hit at the bazar – food, Chinese medicine or Hindi stalls: there is so much to discover. We have many religious festivals on the island! Read about Maha Shivaratri – how Hindu devotees walk through the island and bring back holy water in offerings to Shiva! One of the top 3 public beaches in the North of Mauritius – Mont Choisy beach is a beautiful quiet and long beach. Ideal for lazying in the sun and kids playing in the water! Another local favourite and very busy – the small but so beautiful beach in Trou-aux-Biches! Fine sand, check! Turquoise and clear waters, check! Great restaurants not far, check! A fabulous family beach – liked by locals and tourists alike.